Amos was a shepherd, called by God to be a prophet.His story is found in the book of Amos in the Bible. Amos says what God tells him, but after a while, the people of Israel—the primary target of his God-given proclamations—get tired of Amos and what he says, telling him to be quiet and go back home. Interestingly, Peter, the disciple of Jesus, is given a similar warning by the authorities. Both Amos and Peter decline, insisting that they must do what God tells them to do. God then gives Amos another stinging word. 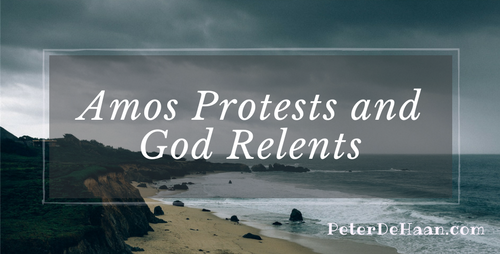 Amos protests and God again relents. Then God gives Amos a third oracle. This time Amos says nothing. I wonder if Amos gave up too soon. I wonder if we sometimes make the same mistake.